So our crowdfunding campaign has started and we can see the pledges trickling in. The idea is to generate funds to allow us to support community groups who want to digitise, preserve and share their WW1 heritage. Considerable effort has gone in to the preparation of the campaign. That meant starting by looking at what kind of project we want to run, and scope it out carefully so that we know what level of funding it would require. The way the crowdfunding works is that we only get the funds if the campaign meets its target. Setting it too high may mean we get nothing. Still it is not possible to set too low a target – we have to make sure we can deliver the project. In our case, we are hoping to raise £80,000. However, we could deliver a smaller project for less, so we have set our minimum target at £40,000, with the hope of raising twice that. That means that if we get £40,000 or more, the project will go ahead. If we get £39,990, the campaign has failed and the money will be returned to the people who pledged it. That means nobody risks giving money to a project that cannot go ahead. In addition to planning and costing the project, the bulk of the preparatory work for the campaign has been to prepare the communication activities. If nobody knows about the fundraising we won’t get any contributions, so a good communications plan is a major requirement. To do so has involved liaising with a range of people who can offer advice and guidance and creating a lot of lists; lists of people and groups that can help get the message out, lists of people and organisations that can support us in one way or another, lists of potential donors (corporate, charitable, individual), lists of channels and methods to use, and more. We have drawn up key messages to communicate, prepared information packs with illustrations, descriptions, and pictures, and sent out press releases. Some of this was disseminated before the campaign started, other is to be released throughout the campaign. Social media plays a big role in our campaign, as a means to reach large number of people quickly. As part of this we have tried something new to us: Thunderclap. Thunderclap calls itself a ‘crowdspeaking platform’ and is a means to let you release a message through a large number of social media accounts at the same time. You ask you friends and contacts to sign up, and on a set date and time the message is sent out through everyone’s accounts. It happens once and only once. Out thunderclap took place on June 6th at 9am. It was sent out through 113 accounts which together have an audience of approximately 250,000. Did you see it? If not, you can still be part of the campaign and help us save the memories from the First World War before they are gone forever. Just go to https://oxreach.hubbub.net/p/lestweforget/ and donate. If you are quick, your contribution will be matched by Europeana, which means that for every pound you donate, we get two. 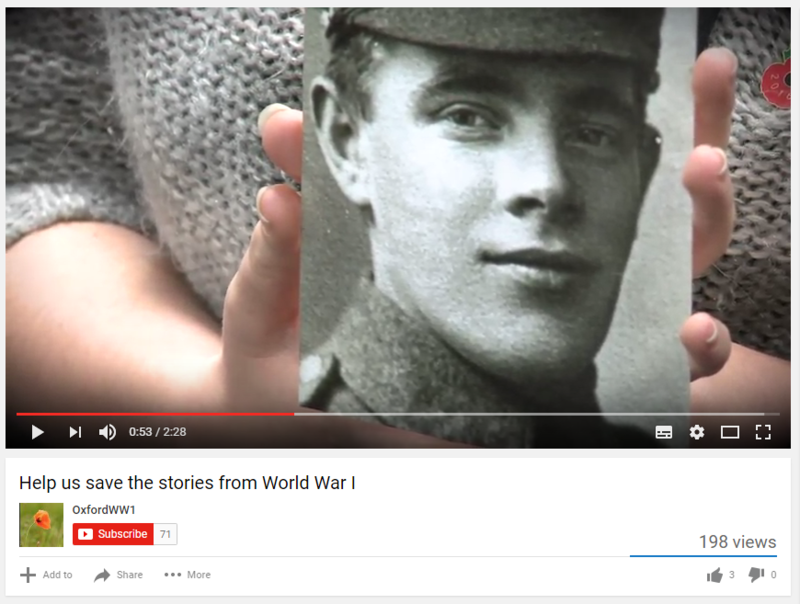 And we all can look forward to preserving more stories of the First World War. Lest We Forget.